DC Office Cachar Recruitment 2018 August | Goan Burah Posts :- Applications are invited from the intending candidates in Assam Gazette of Part IX (Standard form) for filling up the post of 324 (three hundred and twenty four) numbers of Goan Buras (It may be Gaon Bura but in official notification mentioned as Goan Buras) against the concerned lot Circle wise indicated below. 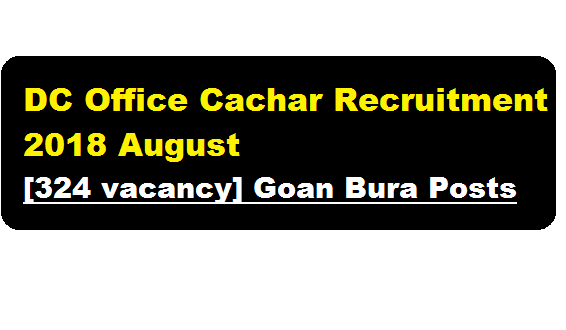 In this section, we will discuss in detail about Recruitment of Goan Bura posts under DC Office Cachar Recruitment 2018 August with all the details and requirement. The application may be submitted during office hours on or before 20/09/2018 up to 5:00 P.M in the Office Chamber of the concerned Circle Officer. In case of any holiday falls on the closing day the applications will be received on the next day. 1. The applicant should be a citizen of India and a permanent resident of the village/one of the villages in respect of which he seeks appointment. 2. The applicant should be minimum 35 years of age and the applicant should be minimum 10th standard pass from a Board/ Institution recognized by the State/Central Govt. 3. The applicant should be physically fit and have sound mind. 4. The applicant should not have been declared as insolvent or defaulter in payment of any govt. dues .In this regard candidates should submit Bakijai Clearance, house tax clearance from concerned G.P. 5. The applicant should not be a Government employee or a member of any political party.